With much having been made of the significance of recent open-loop scrubber bans by Singapore, Fujairah, and China, one of the main manufacturers of the systems says the impact for its customers is minimal. 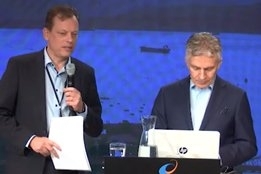 "We haven't seen any impact among our customers so far due to bans in some port areas coming in," Wartsila's Roger Holm, EVP & President, Marine Business, said today during the firm's latest earnings call. "And this is really due to the fact that if you look at the total operational profile, it's just a small part that would operate in these areas. So the impact on the business case for our customers is minimal." And while Holm says that should the landscape ever change Wartsila also offers hybrid scrubbers - able to operate in both open or closed-loop modes - for now the firm sees no need for that. "Still for us, the majority that we sell is open-loop scrubbers, but we have technology then to expand on the hybrids if that's needed. But so far, we haven't seen any indication on that one," Holm said. The Exhaust Gas Cleaning Systems Association (EGCSA) this week was the latest scrubber lobby group to criticise the recent bans, following on from the Clean Shipping Alliance 2020 (CSA 2020) last week saying any attempt to link the bans to global scrubber regs was "fake news". The argument against scrubbers also progressed, with a number of NGOs calling for a complete ban on heavy fuel oil and the use of scrubbers within European Emissions Control Areas (ECAs).